Filippo Brunelleschi, one of the great architects of the Italian Renaissance, died on this day in 1446. Brunelleschi was on the forefront of a group of Renaissance artists intent on breaking with the ideas of the past and forging a new art for a new Europe. 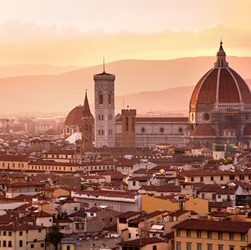 Born in 1377 in Florence, Brunelleschi was trained as a goldsmith and metalworker and educated with the hopes of becoming a lawyer like his father. But from the start, Brunelleschi exhibited a natural artistic inclination. In the early 1400s, he visited Rome to study the ancient Roman ruins, where he gained inspiration and began working as an architect. In 1419, he was commissioned to complete the Duomo (or dome) of the Cathedral of Florence. It was an immense task, and one that occupied a great deal of Brunelleschi’s life and talent. To complete the massive dome, Brunelleschi invented and patented a hoisting machine, inspired by an ancient Roman contraption, to raise the masonry needed for the dome. He used more than 4 million bricks in the Cathedral’s spectacular dome, which he completed in 1436. The Duomo of the Florence Cathedral remains the most defining attribute of Florence’s skyline to this day. Brunelleschi’s later works include the Capella dei Pazzi, a church that is considered a masterpiece of Renaissance architecture, as well as fortifications used by Florence in military struggles against Pisa and Siena. Throughout his life’s work, Brunelleschi was committed to advancing mathematics and engineering, often drawing inspiration from his study of ancient monuments. He invented hydraulic machinery and elaborate clockwork. But he is most famous for developing one-point linear perspective, a style that revolutionised medieval painting and allowed for a more naturalistic style. Linear perspective spread throughout Italy, Europe, and the world and remains to this day the standard for studio art. Caption: Brunelleschi’s legacy includes the Duomo in Florence, which is the highlight of the city’s skyline.